Thursday shows us how to make an 8-fold zine. We know (and love) Thursday from the Portland tech community, where we first met through the local PyLadies chapter. She’s since written the excellent Responsible Communication Style Guide, a great resource for UX writing (and most other kinds of writing). Her latest project, A Haggadah of Our Own is, in its own words, “an inclusive and accessible alternative for anyone hosting a Passover seder”. 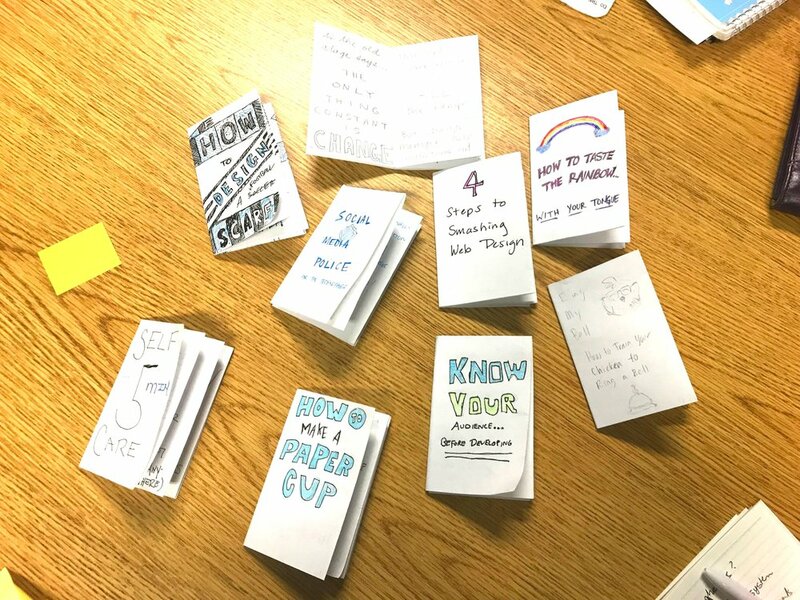 From Social Media Rules for Seniors to How to Train a Chicken to Ring a Bell, the workshop group shared diverse and awesome knowledge in their zines! Religions come from zines: small ideas shared beyond their originator that accrete into belief systems. Consider the beginnings of Christianity. The story of Jesus’ life is based on a set of Gospels, the written accounts of that life from various writers who were trying to make sense of what they saw and heard. Four of the Gospels have been deemed canonical — which we can take here to mean as “worth reading” — though there are at least six other gospels of similar provenance. Those are, in some sense, the zines of the era that didn’t get reprinted. A zine is generally defined as a self-published work reproduced in the cheapest fashion possible. The concept of “self-publishing” is tricky, by the way. Publishing is a relatively new phenomenon. Mass communication arguably started with Johannes Gutenberg’s invention of the printing press in 1439. Even then, most printing was self-published if we assess it by today’s standards: writers often financed the printing of their works, including contradictory pamphlets to have public arguments. Publishing as we think of it today (companies bringing out multiple titles in a year that they have licensed from writers) arguably started in the 19th century with the development of industrial presses. The “death” of publishing we’re hearing so much about these days could just as easily be described as a return to a status quo that has lasted for most of humanity’s existence. To be cheaply printed is not enough to make something a zine. Most zinesters create zines as a way to share ideas, art, and other creative work outside of official channels. Subversive zines are common because anyone can create a zine without needing the approval of an editor, a publisher, or, as the case may be, a priest. Unlike many other media, most zine consumers know that they can create their own zines if they want to. Zine creators don’t need big fancysoftware packages or an initial order of 1,000 copies to make something new. If they encounter a zine that seems to be complete and total bullshirt, they can make their own rebuttal. Needing to tell someone they’re wrong is a powerful motivator for making your own zine. Zine culture prioritizes participation. Sharing zines is core to the concept of what a zine is: a small act combining creativity and curation. Zines and their spiritual predecessors are meant to be passed along as you finish reading them so that other people can see a piece of art or learn a nugget of information. That handoff is zine culture. Many people will read and share zines who will never make their own. That characteristic, in particular, is something that I think nurtures religious thought. The Protestant Reformation started when Martin Luther wrote out his 95 theses . I know most depictions of Luther sharing his work involved him nailing it to a church door, but the 95 Theses were a printed document almost immediately, to make it easier to share. It even started a pamphlet war, with Luther and another religious leader responding publicly to each other’s teachings. Pamphlet wars over religion were common in the centuries immediately following Gutenberg’s invention. Suddenly faith leaders had a platform where they could demonstrate the validity of their beliefs to people they’d never meet or correspond with. The number of Christian denominations exploded during this era, driven by the zines of their time. Religious progress depends more on the pamphlets, zines, and other personal media of believers to spread than anyone assumes. Page from the Golden Haggadah, probably Barcelona, c. 1320. 586 BCE — Babylonians destroyed the First Temple in Jerusalem. Modern scholars saythe Book of Exodus was written after the destruction of the First Temple. It was basedon an oral history composed around 1000 BCE recounting stories suggested to haveoccurred yet another thousand years before that. Between 170 CE and 360 CE — Someone (or some people) compiled the Haggadah.The Haggadah is more of a list of recommendations than a list of requirements.Different communities develop their own Haggadahs and traditions, often in local languages (rather than Hebrew). By 400 CE — Talmudic scholars suggest throwing matzah at inattentive children duringthe seder. Around 930 CE — Rabbi Sa'adiah ben Yosef Gaon included the oldest currentlysurviving Haggadah in one of his translations of works in Hebrew to Judeo-Arabic. Around 1200 CE — Jewish communities in Sarajevo, Barcelona, and other Europeancities create illuminated Haggadahs (some with added poetry!). 1439 CE — Gutenberg invented the printing press. Haggadah that historians can confirm. 1600 CE — 25 different Haggadot were in circulation. 1900 CE — 1,269 different Haggadot were in circulation. The big jump in versions available was due to the development of industrial presses. 1932 CE — The Maxwell House Haggadah launched, offering free copies at events, through the mail, and directly through organizations like the U.S. armed forces. Maxwell House Haggadahs are still offered (and used), setting the record for the longest running print campaign. Maxwell House has updated their version since 1932, including adding gender-neutral language. assassination of Martin Luther King Jr. The Haggadah compiled for the event starts a new era of event-specific and community-specific Haggadot. 1977 CE — The Women’s Haggadah appeared in Ms. Magazine , offering an easily accessible alternative to the male-gaze built into a traditional Haggadah. Today — More than 3,000 different Haggadot are available in print with thousands more available digitally. There’s even a web app (Haggadot.com) that will help you createyour own. With thousands of different versions of the Haggadah available, why would someone create yet another Haggadah? That is a good question: I’ve spent a lot of time asking myself this. I answered “yes” (and I’m running a Kickstarter for that new Haggadah if you want to seeexactly which parts of the Haggadah I’m updating). I came up with several different answers. First, I’d already done most of the work. One of the most common Haggadot you’ll see is not actually a bound book. It’s a bunch of printouts someone has pulled together for their community, just for this year. I’ve done this a couple of times and now have a core base that I reuse. I just need to make that base pretty and get it printed. Second, we need new Haggadot because neither the world nor Judaism are static. Reading through years’ worth of Haggadot makes the passage of time obvious. 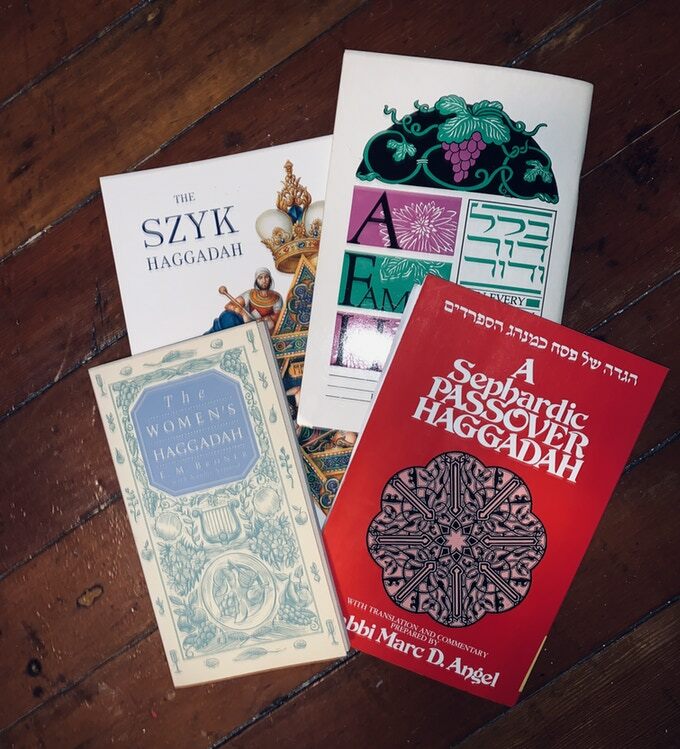 Because of the tradition of developing community-specific Haggadot, a Haggadah can serve as a testing ground for concepts before they’re integrated into other Jewish texts. Furthermore, asking annoying questions is considered a good deed on Passover: it’s an opportunity to talk about modern oppression as well as a time to reflect on history. This does mean that some Haggadot age surprisingly quickly for a set of traditions thousands of years old. The Women’s Haggadah made feminine-inclusive language more common in Jewish communities in a way that drove future Haggadah creators (and creators of other Jewish texts) to adopt similar approaches. A small selection of Haggadot. Of course, just adopting feminine-inclusive language is just one stepping stone to inclusive practices. I admire the Women’s Haggadah, but it dates to 1977 and is chock full of gender essentialism, accompanied by some ableism and racism. Creating a new Haggadah, for me, is an opportunity to push for new understandings of modern oppression. Think of each of these Haggadot, whether published as a marketing maneuver or to advance social justice, as battling zines or a pamphlet war. They move the discussion of how this piece of religion should impact our lives into alignment with or opposition to other ideas and new innovations. Gender-neutral language, for instance, is a linguistic innovation which revolutionized the concept of a Haggadah, along with the concept of who might read from it. I want to create an inclusive Haggadah in part to bring this tradition into alignment with the intersectional feminism I believe is required in a discussion of modern oppression. Third, the Haggadah practically instructs readers to adapt it. One of the most important stories told during the seder is about four children, each of whom provides a metaphor for teaching the story of the Exodus to different types of children, even down to talking to the child who is too young to ask. The obligation to tell the Passover story is so strong that the guiding document instructs us to adapt the story so that everyone can understand it. The Haggadah is also full of lots of convenient lists, songs, and stories that are easy to parody. From a user experience perspective, the Haggadah represents thousands of years of attempts to make a more accessible and valuable experience. Pieces get added and subtracted in an incredibly personalized internationalization process, with routine experiments and ad lib additions stuck in along the way. Errors creep in, but those errors can sometimes make communities trust custom Haggadot more. Personally knowing the person who curated this year’s Haggadah helps significantly with trust. Small errors are reassuring — not only is the creator provably an actual human but because those errors prove that a Haggadah was made specifically for the community using it. Just as small imperfections suggest the authenticity of artisan productions, so typos suggest a personal value to be had from a community Haggadah. An underlying zine culture enables religions to continue to grow and adapt to the needs of practitioners. Participation, both in the sense of creating new materials and sharing them, is necessary for religion. Without that participation, how could a text (or a belief system) compiled two millennia ago still have meaning in our lives? Zines provide an opportunity to try out new ideas, to get feedback, and to figure out how to add these new concepts to our existing beliefs. And we have thousands more zines, pamphlets, and texts to look forward to: belief systems will keep evolving as long as humans can scribble down a few words to share them. Older Post3 career skills you’ll develop in UX Night School’s Online Fall Seminar!